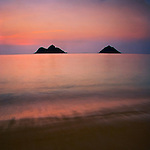 Sunrise at Lanikai beach is gorgeous, especially with the iconic Mokulua Islands in the distance. Lanikai is the Hawaiian term meaning "Heavenly Waters." Lanikai Beach is adjacent to Kailua Beach and is perennially rated as one of the ten best beaches in the world.